NWLA honors Nisei Week volunteer. 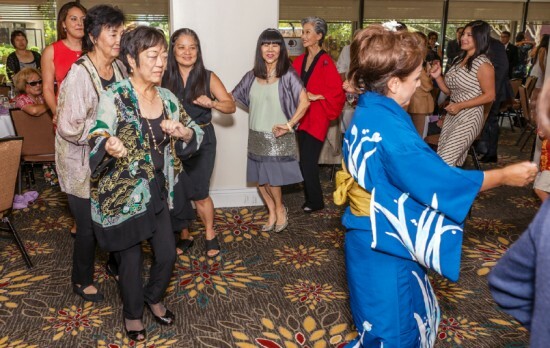 Joyce Wakano Chinn was honored for her four decades of volunteer work with the Nisei Week Foundation at a joyful ceremony on Sept. 19 sponsored by the Nikkei Women Legacy Association. 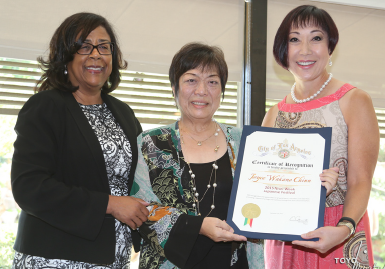 Wakano Chinn received the Legacy Award for her tireless efforts managing the Nisei Week office. The Legacy Award recognizes individual efforts focused on preserving and promoting Nikkei cultural history. Joyce Wakano Chinn receives a check from France Yanai Wong. Mike Okamura, president of the Little Tokyo Historical Society, presented the award as well as a lifetime membership to LTHS. Special guests included Deputy Consul Izuru Shimmura and Jan Perry, general manager of the City of Los Angeles’ Economic & Workforce Development Department. 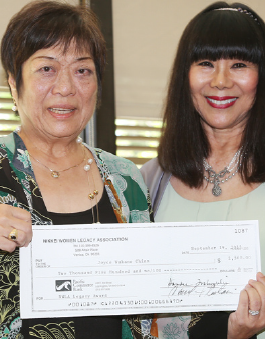 Wakano Chinn also received recognition from the City of L.A., as well as a check for $2,500 to gift to a nonprofit organization of her choice. Former Nisei Week Queen Lauren Kinkade Wong performed “The Wind Beneath My Wings” in honor of Wakano Chinn, who taught at Vanalden Avenue Elementary in Reseda. NWLA is an organization formed by former Nisei Week queens to preserve and promote Nikkei (specifically Japanese Americans in Southern California) history and culture with a primary focus on women. Past recipients of the Legacy Award include Rafu photographer Mario Reyes and Madame Hanayagi Rokumine. The women showed their spirit with a surprise performance of Abba’s “Dancing Queen.” Dancers Dianne Hamano, Carol Itatani, Helen Ota, Nikki Kodama, Faith Ono, Helen Funai Erickson, Stella Matsuda, and Erika Olsen wore zany eyeglasses, red happi coats and two-toned tights for the performance that brought cheers and laughs from the 180 in attendance. It wouldn’t be a Little Tokyo event without onto dancing. At the conclusion of the afternoon, Martha Nishinaka helped lead a special performance of “One Plus One” and Bette Midler’s “You’ve Got to Have Friends.” The joyful dancing was a fitting tribute to Wakano Chinn, who was honored for all the joy she has brought to the JA community.